The all-new 2019 Subaru Ascent 3-Row family hauler is influenced by the brands performance WRX STI. Why do families want ATV? The all-new 2019 Subaru Ascent 3-Row family hauler will be agile thanks to the brand’s high-performance WRX STI. All Ascent trims will get Active Torque Vectoring (ATV), first introduced on the WRX and WRX STI performance cars. Families will have greater control of the 7-8 passenger vehicle and have improved hazard-avoidance capabilities because of it. When Subaru developed the WRX and WRX STI in motorsports they had their eye on winning, but they also knew the information gained would be used in cars you drive everyday. This is what makes the WRX/STI production models extremely high on the fun-to-drive meter. It will also make the new 2019 Subaru Ascent Family hauler a vehicle that will handle extremely well on the road. Why do families want ATV? This technology developed in the WRX STI, makes handling more precise and enhances the vehicle’s agility, especially in the corners. ATV allows the driver to push the driving envelope farther and gives the driver a greater sense of control in extreme situations. The ATV yaw-control system uses the vehicle’s braking system to help turn the vehicle. Subaru now transfers the technology, first developed in rally motorsports, to their all-wheel-drive Ascent. ATV effectively brakes the inside wheels under cornering and apportions greater torque to the outside of the car, reducing understeer and oversteer to allow a more predictable and controlled course through corners. New Ascent owners won’t be taking their 3-Row family hauler to the rally stages on weekends, but they will come across driving situations on the road where ATV comes into play. In wet or icy conditions, Subaru’s all-wheel-drive, torque distribution, engine output, and brakes all work in concert to keep the large vehicle on course. It keeps the driver in control and provides a higher level of safety for everyone. Active consumers will use the new Ascent for weekend adventures like getting to the trailhead for hiking, mountain biking and transportation to the ski slope. 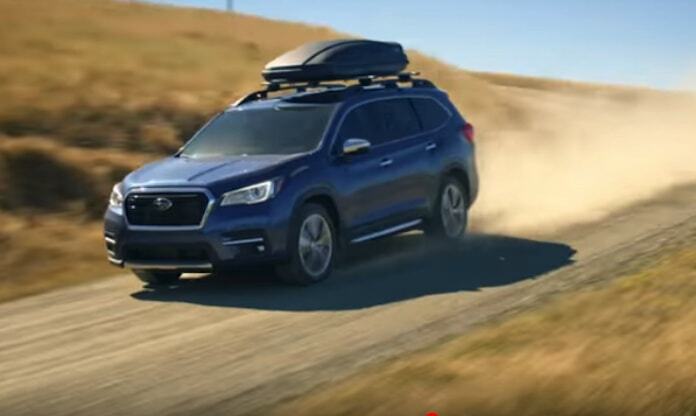 For more fun in the dirt and extreme off-road situations, Subaru’s X-Mode traction assist system is also standard on all 2019 Subaru Ascent trims. Ascent also comes standard with steering wheel-mounted paddle shifters and Hill Descent Control. Ascent will begin arriving in showrooms this summer.